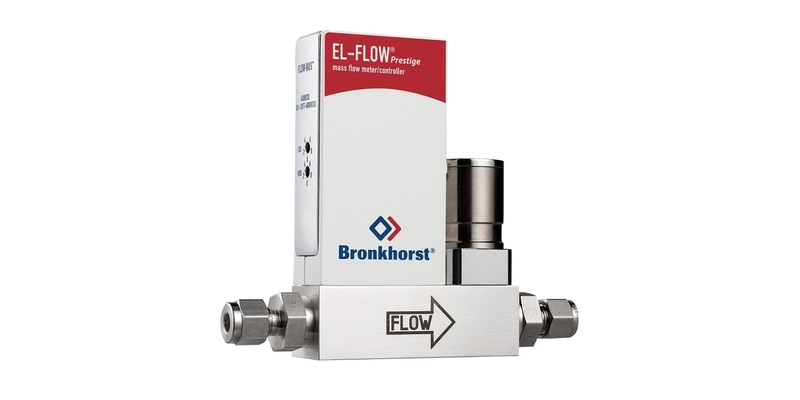 Bronkhorst is a globally recognized innovator in mass flow and pressure measurement and control. 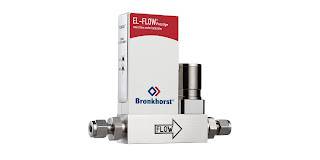 The company's EL-FLOW® Prestige incorporates their latest innovations in gas flow measurement and control. The EL-FLOW® is essentially a thermal mass flow controller, and includes measurement hardware, microprocessor controller, and precision control valve in a single compact unit. Setpoint and output can be transferred to and from the unit via a PC connection, analog port, or one of several possible industrial communications protocols. The instrument uses a new thermal principal for flow measurement, called Differential Temperature Balancing. It is similar to traditional thermal mass flow measurement, but employs two heated sensors and a modified algorithm to process the comparative heat input to each. The innovation delivers a high degree of linearity, with improved stability to boost the controller accuracy. There are several other innovations included in this latest version of the EL-FLOW® mass flow controller. More information is provided in the datasheet included below, but you are encouraged to share all your flow measurement and control challenges with process measurement and control experts. Leverage your own process knowledge and experience with their product application expertise to develop effective solutions. EL-FLOW Prestige Mass Flow Controller and Flow Meter from Hile Controls of Alabama, Inc.